Not far to go now, just a little ways down this ditch and we'll be able to cross-over. Then a short wade to the blind where we'll set up to photograph the waterfowl that are using Lasalle Fish and Wildlife area as a rest area during their spring journey north. 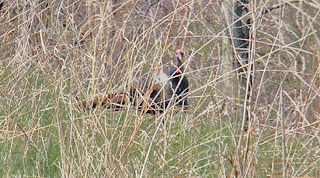 Ranger looks as tho that pair of Canada geese and their clutch (the right side of pic), are fair game. Don't worry, he never saw them and besides I've got a rope leash on him, you see the rule on FWS properties is that dogs can run free only during the fall hunting seasons, all other times of the year, dogs must be on a leash. This is to protect the nesting creatures and their young. Its just the right thing to do so when you walk your dog in a natural area, protect the wildlife by keeping your pet on its leash. Settle in to Blind 29. Blind 29 is located on an Island on the south-side of a cornfield. Don't look much like a cornfield from this picture , eh. At this time the Kankakee River is flowing near flood stage, unusually high water for all most a year. As soon as the river drops and the ground is dry enough, my friends who manage this FWS area, will be hard at work planting corn. 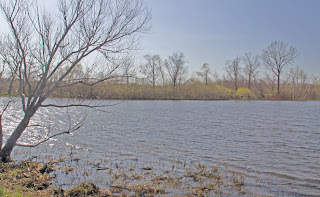 The corn is grown to provide the Migratory Waterfowl that pass thru this part of Indiana, during the fall and winter with food and shelter from the elements. The sales of hunting license pay for this act of stewardship. Therefore, the FWS allows limited and controlled waterfowl hunts. In this particular unit, hunting is permitted only from state provided Blinds. Hunters are choosen to hunt by lottery at 4:30 in the morning. 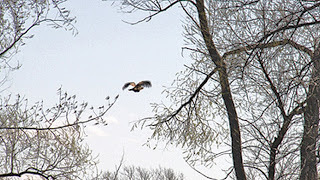 I almost never get to hunt the corn blinds, so I'm happy just to sit here in the spring and photograph the waterfowl and birds in their spring plumage. Keeping me company is a flock of Tree Swallows(Tachycineta bicolor). Reaping the rewards of the wetlands, mid-April and the bayou is humming with mosquitoes. 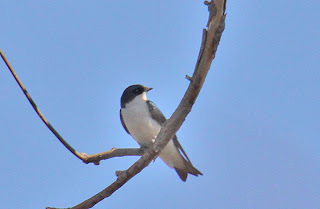 The Tree Swallows nest in tree cavities and can be seen catching insects in mid-flight. They migrate to Central America for the winter. 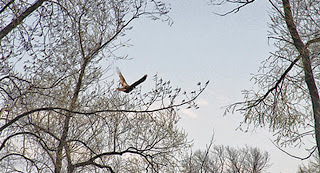 There are many other birds and animals that call the Bayou home and therefore benefit from the funds provided by the selling of hunting licenses to the folks who answer to the call of the wild. Here you can see whats left of the corn from a couple years ago ( a year of high water). Zooming above the corn, if you look closely (remember you can click on all the photos to enlarge them) is a group of Blue-winged Teal (Anas discors). A small duck, about 15" long. Flocks in flight resemble the flight of pigeons, rapid wing beats , ducking and dodging close to the water. A puddle duck, that likes shallow marshes and weedy mud flats. Their primary diet is made up of vegetation and seeds, but like all ducks they will eat bugs and aquatic animals if available. 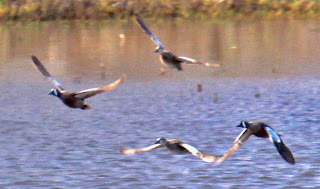 Here are four Blue-winged teal. Two pair of bonded birds. Adult teal bond during the winter months and return to the northern breeding waters as bonded pairs. 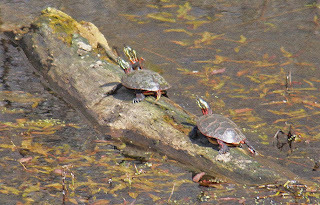 The females make a ground nest in the tall grasses along the shoreline of prairie pothole lakes in the north of the United States and across most of Canada. They are very prolific, sometime raising two clutches of young in a season. Quite a feat, considering they are the first to migrate south in the fall and the last to return to the breeding grounds in the spring. The USFWS says that Blue-winded Teal are the most abundant of the waterfowl and the most harvested. Male(left) and Female Blue-winged Teal! Photography of flying ducks is so frustrating and oh so rewarding, but we'll talk about the technical aspects of flight photography at a later date. Don't let me forget, Okay? 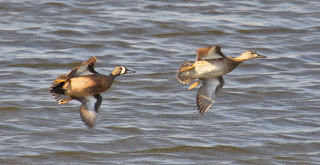 Both sexes are about the same size, the male (left) has blue-gray head feathers and a white crescent that runs between the bill and eye, from the top of the teals head to its cheek behind the eye. The breast feathers are a chestnut brown with dark brown specks on each feather. The tail is black. The female has a light brown head with a white patch behind the eye, her body is light brown, both sexes have an iridescent-green speculum and yellow legs and feet. Why are they called Blue-winged Teal? 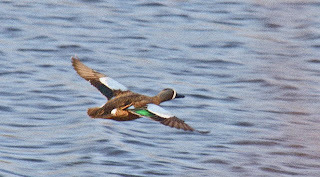 As this pair is flying away from me (like most ducks do when I hunting them), the teal- blue shoulder patches can be seen. Both males and females(right) have them. Lots of time, these guy are moving so fast that a flash of blue is all I'll see and then they are history , as in did I just see .... naw, must have been my imagination. 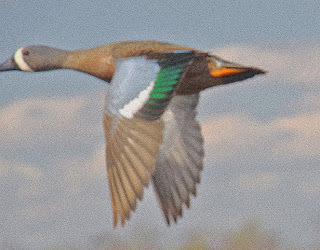 Teal are not the fastest flying duck but their small size makes them hard to see and for me impossible to shoot. I'm a much better shot with the camera. During the fall migration, the males are in eclipse phase. At that time the males plumage resembles that of the females, even tho the cheek crescent is there it is not as distinct. Look at the picture to the left and see if you can determine which birds are male and which are female.